As BP seeks to close a reputed $28 billion cash-and-shares deal, all eyes are on the Russian government’s response. Russia’s biggest oil company, Rosneft, is due to close a deal Thursday to buy British oil major BP’s 50 percent stake in the Russian joint venture TNK-BP, making it the world’s largest publicly traded crude oil producer at the stroke of a pen. The deal was only possible after a 90-day “goodwill negotiating” period with Alfa-Access-Renova (AAR), BP’s Russian partners in the joint venture, stipulated by the shareholders agreement, expired. Rosneft will become a Russian oil national champion accounting for 4.5 million barrels of production a day – more than Exxon Mobil or Shell – against Russia’s total output of about 10 million barrels a day. It will also increase the power of Rosneft’s CEO and Kremlin insider Igor Sechin, who has said he wants to continue the expansion by buying stakes in utilities companies to create an energy national champion. 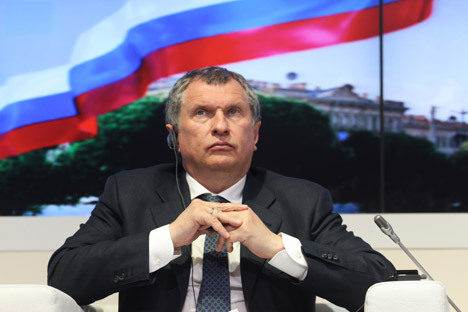 Sechin has reportedly negotiated to buy BP’s stake in a cash-and-shares deal worth around $28 billion – including $15 billion to $20 billion in cash, plus a stake of between 10 percent and 20 percent in Rosneft. Financial analysts in Moscow were divided over whether the deal would put a fair value on TNK-BP, or give BP and their Russian partners a premium for their stakes. “Taking into account TNK-BP Holding’s market valuation of $41.5 billion and non-public assets that we estimate are worth $5 billion, the price of the deal may come with a 20% premium in the case of a buyout from either BP or AAR,” Metropol said in a note to investors. Alfa-Access-Renova (AAR) holds the stakes of billionaires Mikhail Fridman, Leonard Blavatnik, Viktor Vekselberg, and German Khan. The consortium is reportedly not happy at the possibility that BP’s sale to Rosneft would leave them partnered with the Kremlin. AAR had been trying to raise funds to counter Rosneft’s offer, and hired Rothschild bank to organize the financing. AAR offered a reported $25 billion counter-bid for the stake but dropped out of the race as Rosneft dominated the bidding, said a person with knowledge of the decision, Bloomberg reported. Earlier this month, AAR said they would exit TNK-BP if Rosneft bought BP’s stake, either selling to a strategic investor or through an IPO. If the deal is finalized Thursday then Rosneft may also bid for AAR’s stake. The AAR partners have signed a non-binding agreement to sell their stake to Rosneft, Deputy Prime Minister Arkady Dvorkovich said Wednesday, Bloomberg reported. AAR declined to comment. However, analysts said it was unlikely Rosneft could afford to buy all of TNK-BP. “For a company that already has fairly high debt levels, it is already stretched,” said Valery Nesterov, energy analyst at Sberbank Investment Research, the Financial Times reported. If Rosneft does buy AAR’s stake it may take two to three years to complete the deal, analysts say, as Rosneft would have to raise twice as much as it has to buy BP’s stake. While Dvorkovich is in charge of the oil sector in the Cabinet, Sechin wields considerably more influence than his Rosneft post would suggest. The two men have already clashed over which direction to take Russia’s energy sector. Dvorkovich could seize on this deal to exercise his power and try and contain Sechin, who is a close ally and personal friend of President Vladimir Putin. The deal brings a long-running boardroom feud between BP and its billionaire partners to an end. In fact, BP has made a handsome return on its $8bn investment in TNK-BP when it was created in 2003, and has earned $19 billion in dividends from the venture since then. The deal will also reverse BP’s earlier failure to team up with Rosneft in an exploration deal in the Artic and secures the company access to Russia’s crude reserves, which account for a quarter of BP’s reserves. The TNK-BP deal is the most significant reorganization of the Russian oil industry since the breakup between 2004 and 2007 of Yukos, once the country’s biggest private oil company. Most of Yukos’s assets ended up folded into Rosneft after a series of controversial auctions dominated by the state oil firm. Sechin was reportedly in London on Thursday and meeting with BP’s board to discuss the details of the deal. BP was expected to receive a formal offer for its TNK-BP stake from Rosneft by 9am Thursday in London. BP’s board is to meet on Friday to consider the company’s options. The endgame in the three-way negotiations could still yield some surprises, however. "BP and AAR have not officially announced the completion of the deal,” analysts at Metropol said in a note to investors. “It is still possible that BP could decide to retain its TNK-BP stake. Also, it has become known that TNK-BP management supports an interim dividend payment of $4.1 billion. Analysts saw the deal as an overall positive for Rosneft. “We see Rosneft as a potential beneficiary of BP becoming its major shareholder,” said Alexei Kokin, of . In this scenario, we believe that BP would play a role in operating and financial management and apply TNK-BP?s expertise to Rosneft,” said Alexei Kokin, senior oil and gas analyst at UralSib. "); } // вывод номера страницы //$(".art_content").prepend("